The Historic Centre represents a supreme manifestation of Medieval urbanism (the New Town of Emperor Charles IV built as the New Jerusalem). 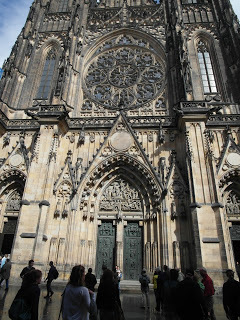 The Prague architectural works of the Gothic Period (14th and 15th centuries), of the High Baroque of the 1st half of the 18th century and of the rising modernism after the year 1900, influenced the development of Central Europe, perhaps even all European architecture. Prague represents one of the most prominent world centers of creative life in the field of urbanism and architecture across generations, human mentality and beliefs. Prague belongs to the group of historic cities which have preserved the structure of their development until the present times. Within the core of Prague, successive stages of growth and changes have respected the original grand-scale urban structure of the Early Middle Ages. This structure was essentially and greatly enlarged with urban activities in the High Gothic period with more additions during the High Baroque period and in the 19th century. It has been saved from any large-scale urban renewal or massive demolitions and thus preserves its overall configuration, pattern and spatial composition. 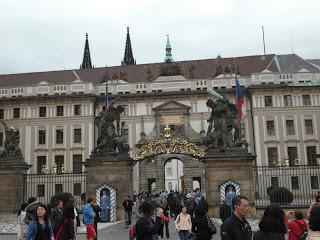 I was most impressed with the architecture of the some of the important buildings such as Prague Castle, the Cathedral of St Vitus, Hradćany Square in front of the Castle, the Valdgtejn Palace on the left bank of the river, the Gothic Charles Bridge and the the Romanesque Rotunda. 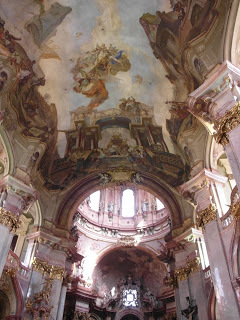 St. Nicholas Church on the square Lesser Town in Prague, was most impressive with over the top Baroque style interior. I was taken by the paintings on the ceilings, pulpit and naves. Prague has at least six different national art museums and galleries, I visited the most contemporary VELETRŽNÍ PALACE housing the 19, 20 and 21 century modern art. I found the work of Antonin Prochazka who's work was influenced by the Cubistic period and mixed media. Dave and I finished this romantic city with trip down the river, and a train ride to the Karlstejn Castle out side the city. The Highlight of the trip for me was the classical performance of the Czech Philharmonic in the grand Concert Hall playing Antonín Dvořák and Tchaikovsky. new adventures. Give me your feed back. Next is PARIS!!! My love!